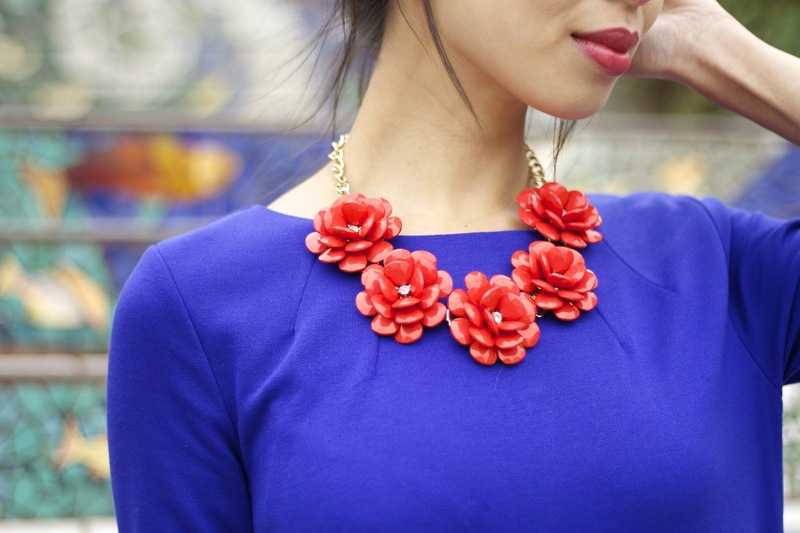 How stunning is this red rose statement necklace? The design is inspired by J.Crew and costs a fraction of the price at Benevolent Jewels. 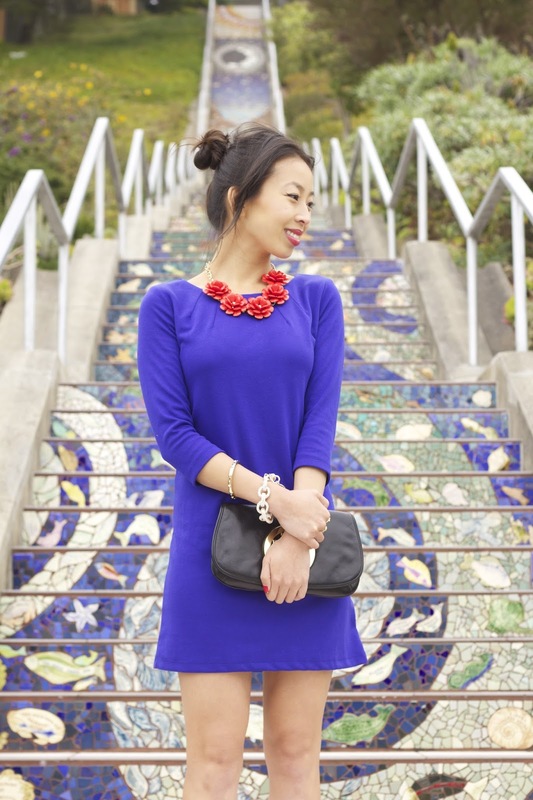 It definitely takes my blue blue shift dress up a notch and I love the blue and red combo. I have a 4 year old German Shepherd named Mochi and have been a dog lover my entire life. When I found out the Benevolent Jewels is currently representing Barrio Dogs, an organization that aims to raise awareness of responsible animal care and preventing crime against animals in Texas, I was so honored to be able to help them spread the word. Steal: Essential Buttoned Shift Dress from Forever 21, here. Splurge: Faux Leather Trim Ponte Shift Dress from Nordstrom, here. Steal: Peep Toe Platform Wedge from DailyLook, here. Splurge: Natalea Leopard Wedges by Ivanka Trump, here. Clutch: Logo Clutch by Tory Burch, here. Steal: Grayson Bar Bag from Linea Pelle, here. Splurge: Logo Clutch by Tory Burch, here. Steal: Pine Blooming Grove Necklace from Benevolent Jewels, here. Splurge: Beaded Rose Necklace from J.Crew, here. Bracelets: Rose Gold Pave Beauty Bracelet thanks to Derng, here. Elaina Bangle thanks to Sequin, here. Steal: Classic Hammered Chain-Link and Cutout Chevron Bangle Set from Forever 21. Splurge: Rose Gold Pave Beauty Bracelet thanks to Derng, here. Elaina Bangle thanks to Derng, here. Your necklace and dress look amazing! Is this staircase in San Francisco??? I love your leopard wedges with this colour of dress. Maybe I'll give it a try too sometime. I own this same dress in a different colour (well.. print and colour -- it's cream and has stripes), and I've noticed it pilling around the neckline! I'm curious as to how you deal with this? Hmm.. I find mine naturally pills together around the shoulders and neckline because of the trim and stitching. But I just always pill it down to keep everything straight and wearing a statement necklace helps draw the attention away from the dress. Hope that helps! Hehe.. It's always been a dream of mine to be able to ride on a big dog like a pony.. :P But yes, those leopard wedges are super comfortable!! p.s I loved your post about removing the sticker below the shoe!! I love the red necklace,very nice! Hello, I commented on your photo on Facebook,but I have to come here and say that you look gorgeous! I'm following you now on Facebook and bloglovin.Would you like to follow me back? Love the dress and the necklace! Its sooo pretty (: im going to buy one of those bracelets for myself!